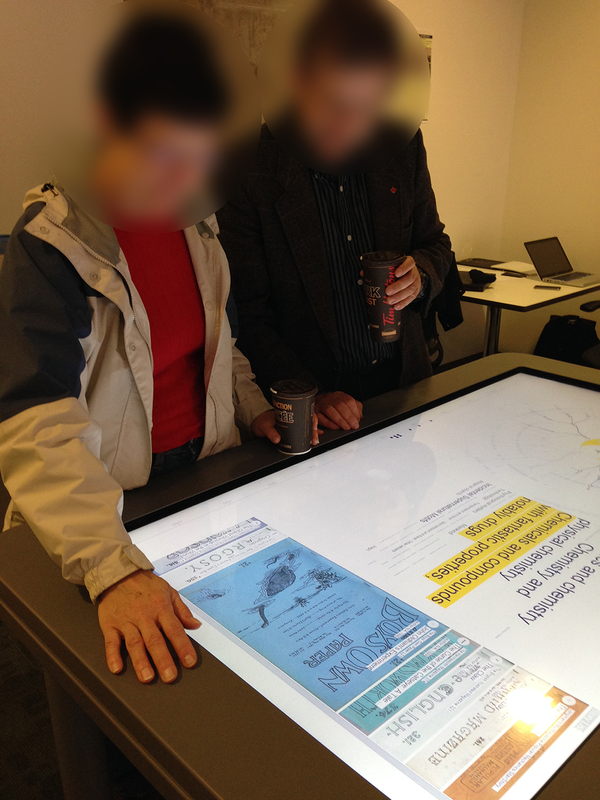 Speculative W@nderverse at an open house event at the University of Calgary Taylor Family Digital Library. Uta Hinrichs, Mennatallah El-Assady, Adam James Bradely, Christopher Collins and Stefania Forlini. Risk the Drift: Stretching Disciplinary Boundaries Through Critical Collaborations between the Humanities and Visualization. In Proceedings of the 2nd Workshop on Visualization for the Digital Humanities (Vis4DH'17), 2017. http://vis4dh.dbvis.de/. Uta Hinrichs and Stefania Forlini. In Defense of Sandcastles: Research Thinking through Visualization in DH. In Proceedings of Digital Humanities 2017 (DH'17), 2017. Stefania Forlini and Uta Hinrichs. Synesthetic Visualization: Balancing Sensate Experience and Sense Making in Digitized Print Collections. In Proceedings of the 2017 Conference on Digital Preservation for Social Sciences and Humanities (DPASSH'17), 2017. Uta Hinrichs, Stefania Forlini and Bridget Moynihan. Speculative Practices: Utilizing InfoVis to Explore Untapped Literary Collections. IEEE Transactions on Visualization and Computer Graphics (Proceedings Visualization / Information Visualization, Oct. 2015), 22(1):429-438, 2016. Stefania Forlini, Uta Hinrichs, and Bridget Moynihan. The Stuff of Science Fiction: An Experiment in Literary History. Digital Humanities Quarterly (DHQ); DHSI Colloquium 2014 Special Issue, 10(1), 2015. http://www.digitalhumanities.org/dhq/vol/10/1/000228/000228.html.